The first decision you have to make when shopping for a printer is either a laser or inkjet. The advantages of laser printers are sharp text, fast print speeds, and high volume printing. Plus although they can cost more initially than inkjets, each page they print costs less, making them ideal for high volume office settings. The main negative is that they do not produce photos as good as inkjets. You primarily will see monochrome – or black and white – laser printers, but color versions are becoming cheaper. Multifunction printers (MFP), or all-in-one, printers that scan, copy, and fax in addition to printing are also available. For this top 10 list we are going to review personal up to medium-sized office laser printers that cost less than $500 as opposed to large business work-groups. At the bottom of this article we also provide a spec comparison chart for your review to easily compare each model. If you need more help making your buying decision see our Laser Printer Buying Guide. 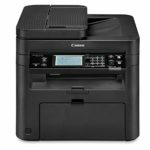 We selected the $160 Canon imageCLASS MF247dw as the best laser printer. The value you get for a printer of this caliber at this price point is really amazing and makes a great choice for a home office or small business. The MF247dw is a small, monochrome multifunction laser version with good printing output quality and decent speed. Other features include Wi-Fi, duplex printing, automatic document feeder, and automatic scanning of two-sided documents. The only downside is that it is not designed for high volume printing with a recommended monthly volume of up to 3000 pages. Therefore we recommend the Canon imageCLASS MF247dw for any user who will stay within that volume threshold and who does not need color or instead uses an inkjet for any color documents/photos. Another top-notch black and white laser printer is the $160 HP LaserJet Pro M402n. It is just a printer and does not have multifunction capabilities, but it prints out text that is near perfect and does it fast too at a max speed of 40 pages per minute. You can get the cost down to 2 cents per page if you purchase the 9000-page yield toner. With a recommended 4000 page monthly print volume, you get a machine that can handle medium duty printing tasks for relatively cheap. The biggest weakness of the M402n is picture and graphic quality which is just average at best. It also lacks auto-duplex printing and Wi-Fi. 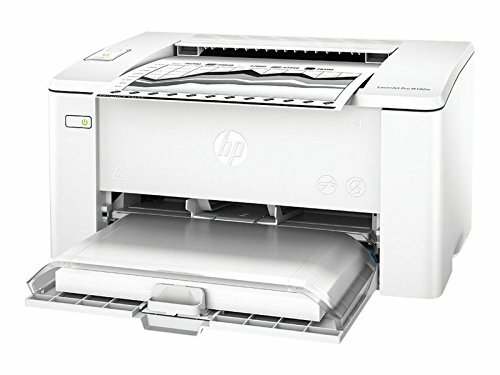 Overall we recommend the HP LaserJet Pro M402n for medium duty offices or heavy duty personal printer where the primary needs are just text documents. If you need a good color laser printer and don’t need multifunction capabilities then you should choose the $300 Brother HL-L8360CDW. It received the PCMag.com Editor’s Choice award primarily due to its speed, excellent print quality, and competitive running costs which can be as low as 1.9 cents per black page and 10 cents per color page if you purchase the high-yield black and color toner cartridge. There really isn’t any significant negatives to the HL-L8360CDW, however don’t expect outstanding photo quality and remember this model is not an all-in-one, so no copying or scanning. If you have a business or home office that needs color printing then the Brother HL-L8360CDW is perfect for you. 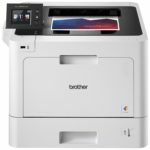 The $279 Brother MFC-L5700DW multifunction laser printer is a great choice for business offices that need a reliable machine to handle around 3500 pages per month. One big positive is the low running cost (if you purchase the 8000 page high-yield toner) of about 1.6 cents per page. Other features of the MFC-L5700DW include a speed of up to 42 ppm, auto document feeder and auto duplex printing, excellent text quality, and solid graphics output with a max resolution of 1200 dpi. Photo printing is about average and the ADF lacks automatic duplex scanning. Overall we recommend the Brother MFC-L5700DW for any office or business that needs an all-in-one laser printer with low running costs. 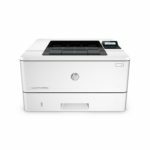 We chose the $429 HP LaserJet Pro M281fdw as the best color all-in-one laser printer. 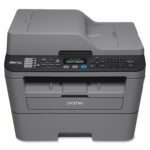 This model combines high quality output with lots of functionality like auto-duplex printing, wireless connectivity, copying, scanning, and even faxing. The main downside is that it is the most expensive laser printer on our list and replacement toner is not cheap either. Also with a monthly recommended print volume of 2500 pages, the M281fdw is not meant for high volume offices. Therefore, we recommend the HP LaserJet Pro M281fdw for anyone who needs the ability to print or copy in color, but who does not have super high volume printing needs. The $167 Brother MFC-L2700DW is getting a bit old, but it still remains one of the best-selling laser printers on Amazon. This MFP has somewhat low printing costs of 2.6 cents per page with the high-yield toner. 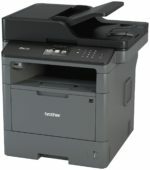 Other features include duplex printing, 35 page auto-document feeder, and wireless connectivity. The text printing quality of the MFC-L2700DW is decent, however the graphic output and copies are below average. Overall the Brother MFC-L2700DW is best for heavy-duty personal use or moderate use in a small office setting. Another high-quality color version is the $205 Canon Color imageClass LBP612Cdw. It has terrific looking text and graphics, respectable speed, and connects wirelessly if needed. On the downside, it has small paper tray capacity of 150 pages and running costs that are somewhat high – 3.6 cents for black and 16.3 cents per color page for the higher yield toners available. Overall we recommend the Canon Color imageClass LBP612Cdw for anyone who needs a light duty color laser printer. 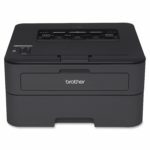 At time of publication the $104 Brother HL-L2340DW was the best-selling laser printer on Amazon. We have seen it on sale for as low as $79.99, which would make it an amazing deal. The text quality of the HL-L2340DW is decent enough, but graphics just slightly below average and images are rather poor. Running costs are decent at around 2.6 per page with the purchase of the high-yield toner. It also has duplex printing and wireless and USB connection, but no Ethernet connection. If you are looking for a compact, decent cheap laser printer then the Brother HL-L2340DW is a good choice for you. Remember this is not an MFP, so no copying or scanning. We selected the Samsung Xpress SL-C430W as the best cheap color laser printer which sells for around $109. Despite its price, which is about as low as you can find in a color model, this compact model it still has pretty good quality text and graphic output. However color photos are just fair. The negatives for the SL-C430W are that it is slow, just 4 ppm in color, and running costs are higher than average. It also lacks wireless connectivity. We recommend the Samsung Xpress SL-C430W for anyone who needs a cheap personal printer that can print in color. We do not recommend this model for office settings with higher volume requirements. We wanted to make sure at least one laser printer below $100 made our list for buyers where their budget is tight. So that model is the HP LaserJet Pro M102w which sells for just $88. It prints great looking text, but just average graphics and images. The M102w does not support auto-duplex printing, nor does it have an Ethernet port. It does have wireless and USB connections. If budget is your biggest concern then you should consider the HP LaserJet Pro M102w. This should only be used as a personal printer and we only recommend it for light duty uses since it has somewhat high running costs and low monthly duty cycle. Each machine is designed with a specific use in mind. There are versions made specifically for high volume office or business settings which are normally quite large. There are also smaller versions made for home use. There are also plain models that just print and multifunction printers (often shortened to MFP) which can also scan, copy, and fax. Pick one that is designed for the way you will be using it. Laser printers use a photographic drum to attract electrically charged toner and transfer it to paper, where the image is fused using a heated roller. The print quality you get is dependent on a printer’s resolution, expressed as DPI (dots per inch), but other factors also effect print quality. One of the most important aspects of laser printers is the cost of toner cartridges because in the long run this will cost much more than the printer itself. Most laser models are monochrome, or black and white, which only have one cartridge. For color versions, there may be multiple toners. Each one is rated for how many pages it will last. You should compare how much replacement cartridges will cost along with how long they last to compare the printing cost between different brands. The print speed, or how fast they can print a black or color page, is listed in pages per minute (PPM). Just be wary of manufacturers claims of print speed. A good speed is around 25 ppm with the best ones being able to do around 40 ppm. One feature that can come in handy is duplex printing, or two-sided printing. With this you can get output on both sides of your paper without any tricks or hassles.